Most parents of children with autism are actively and constantly seeking ways to help their children better. Not necessarily to “cure” them, but to help them better function in life and live it to the fullest. We spend a lot of time researching. We spend a lot of time at doctors’ offices, therapies, and Individualized Education Plan (IEP) meetings. Often we have to weigh the material cost of all of this and determine for our families, for our child, which will be the most cost-effective. We can’t afford it all because of both time constraints and money. School issues often take up a HUGE part of these resources. Many times in spite of teacher’s best intentions, we are fighting against a system that doesn’t work for our child, and we are always trying to get a large institution to change so our child can learn. Usually, for us, the other options beyond public school we are told about are homeschooling and private school. For some of us, homeschooling is an option and one that can, in many circumstances, work well. For others, we need someone else to teach our children school subjects because, at home, it is taking everything we have to teach them all the other things they need to learn in life. Some are fortunate enough to be able to place their children in a specialized private school environment where specifically trained individuals can help them reach their highest potential. But for many of us, the price tag is well beyond our grasp, especially when we are dealing with all the medical bills and extra needs that come with our children. There is a new option on my horizon now, and I wanted to share it with others. In a few states and cities, there are charter schools whose niche is children with special needs or autism. These are public schools that are free for our use. They are charter schools that focus and contain the tools for our children (we assume) with special needs to succeed. I hadn’t heard of such schools before. This was intriguing to me and needed more investigation. How would these schools work? And more importantly, do they work? Charter schools and their efficacy, viability, and legality have been in the news nationally and locally in the last couple of years. Charter schools are public schools run by a group of teachers, parents, or other people usually focused on a specific niche. There is Waldorf, STEM, performing arts, prep schools, and many more. These are options that are out there for parents to consider in some states. Often, despite state laws explicitly prohibiting discriminating against children with special needs for admission to these regular charter schools, many do by their admission standards. Indiana Law Repository has a paper entitled Autism Charter Schools: Are They Legally Vulnerable or Viable? This paper outlines many of the legal, possible discrimination issues, and other potential issues surrounding charter schools of this type. It’s well worth reading through to help recognize potential pitfalls that could appear in these schools. Legally, after reading the paper, it appears that like with any challenges to the law governing charter schools of this type, decisions could go either way. One of the things that disability advocates have advocated for a long time is to have the opportunity for all disabled children to be integrated into general education classes with their peers. On the surface, a school that is catering to a specific disability or multiple disabilities looks like it could be a step backward. I wanted to keep my mind open however and see what I could find out about these schools. Charter schools usually have a much smaller student to teacher ratio. Schools that focus on special needs often take that ratio even lower and frequently have an assigned par educator to work with the class. This means a lot more one on one instruction, and someone to help with any problem behaviors that arise. Would your child benefit from this kind of environment? 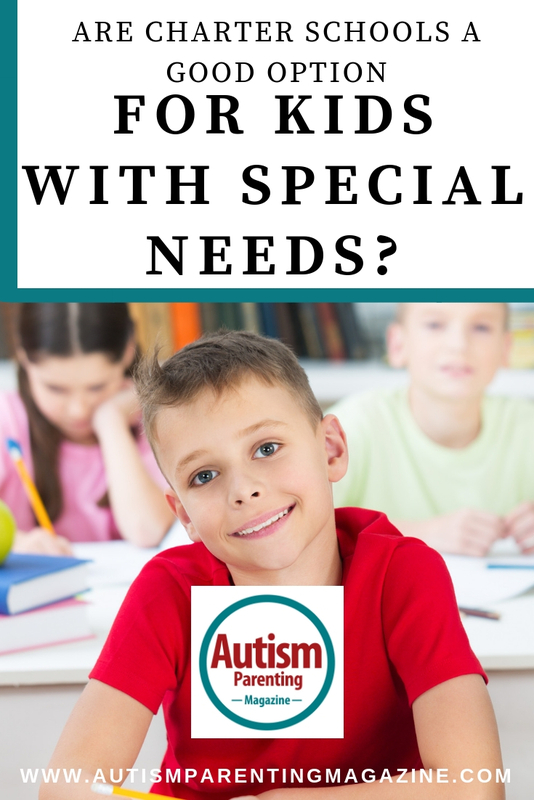 Most of the autism-specific schools are based on applied behavior analysis (ABA) methods. This is often billed as the only scientifically proven therapy to definitively help people with autism. However, the probably best-hidden secret of ABA is that it has been proven to work with a variety of issues such as attention-deficit/hyperactivity disorder (ADHD), smoking cessation, getting kids to do their homework… It is not something that only works for autism. Because these are public charter schools, they are in most cases obligated to let anyone attend who desires to. Frequently they accept children who don’t have special needs, such as siblings of those who do or maybe just kids who need a smaller, more supportive environment. From a parental perspective, after examining many aspects of the issues surrounding charter schools catering to special needs, my thoughts are these. Research clearly shows that early intervention in children with autism gives them the most benefit. This is likely the case with many of the other cognitive diagnoses as well. These schools would provide that. I do feel it is critical to have opportunities for children with autism to be in school with those who do not have autism and vice versa. Both sets of children will learn a great deal from the other. This type of charter school could be most beneficial in elementary or even middle school, with a transition into mainstream high school if possible for the child. As with any school, it would be best to have a rigorous method that ensures students are learning, have access to typically functioning peers, are participating in and utilizing the IEP appropriately, and there are caring adults whose mission is to help our kids learn. If you have these things, any school should theoretically work. Teachers, parents, and friends of those who have attended these types of schools have a lot of good things to say about them. A non-exhaustive list of states and schools that have these resources can be found here. Disclosure about our schooling experiences: Calleen attended both public school and was homeschooled. She has homeschooled her children, sent them to the neighborhood school, and sent them to a charter school. She has personally fought the fight to have her child included in a charter school that refused to take him because he has special needs. Calleen Petersen is an ordinary mom who believes in standing up, speaking out, and sharing her truths. She enjoys living in the Pacific Northwest with her two children, and husband. She writes about special needs, life, and her thoughts.